Mitochondria are organelles responsible for energy production for the cell and also regulate apoptosis. Substances such as fatty acids and glucose are converted to ATP by the process of oxidative phosphorylation (OXPHOS). [1, 2] The mitochondria contains an inner and outer membrane which allows for the formation of electrochemical gradients across the inner membrane to drive energy production. When food is consumed, fats are broken down into acetyl CoA and carbohydrates are converted to pyruvate. The electrons from the calories consumed are gathered by the tricarboxylic acid (TCA) cycle and β- oxidation. These electrons are then transferred to either NAD- to form NADH or FAD to form FADH2. NADH transfers the electrons to complex I in the electron transport chain (ETC), where the they are oxidized. 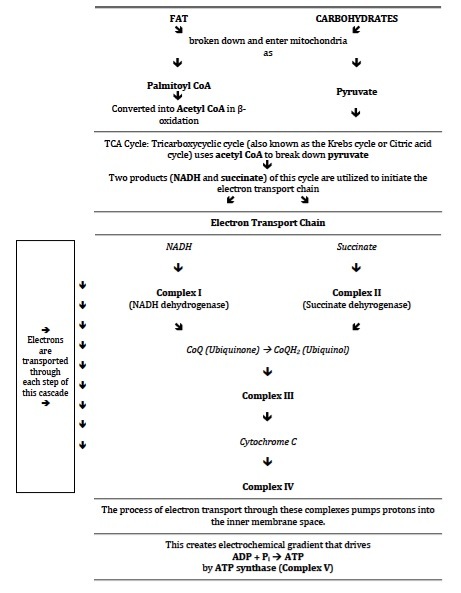 From the TCA cycle, succinate transfers electrons to complex II. Both succinate and NADH transfer electrons to ubiquinone, or coenzyme Q10 or CoQ, to form ubiseminquinone (CoQH-) and ubiquinol (CoQH2). Electrons from ubiquinol are then transferred to complex III, cytochrome c, and then complex IV. Following this, the electrons are transferred to ½ O2 and water is formed. The ETC releases energy, which drives protons across the inner membrane to form an electrochemical gradient. This potential energy causes complex V to convert ADP+Pi to ATP, or a usable form of energy for the cell. The following chart depicts this process. 2. Close proximity to the inner mitochondrial membrane, where electrons are leaked. Mitochondrial damage can result in increased electron leakage, and therefore increased ROS. This creates a positive feedback loop in which mtDNA damage and ROS continue to increase. 1. Wallace DC. The mitochondrial genome in human adaptive radiation and disease: On the road to therapeutics and performance enhancement. Gene. 2005;354:169-180. 2. Chabi B, Adhihetty PJ, Ljubicic V, Hood DA. How is mitochondrial biogenesis affected in mitochondrial disease? Med Sci Sports Exerc. 2005; 37(12): 2102-2110. 3. Ren J, Pulakat L, Whaley-Connell A, Sowers JR. Mitochondrial biogenesis in the metabolic syndrome and cardiovascular disease. J Mol Med 2010; 88:993-1001. 4. Bugger H and Abel ED. Molecular mechanisms for myocardial mitochondrial dysfunction in the metabolic syndrome. Clinical science. 2008;114:195-210. 5. Kim JA, Wei Y, Sowers JR. Role of mitochondrial dysfunction in insulin resistance. Circulation research. 2008;102:401-414. 6. Brookes PS, Yoon Y, Robotham JL, Anders MW, and Sheu S. Calcium, ATP, and ROS: a mitochondrial love-hate triangle. Am J Physiol Cell Physiol. 2004;287(4):C817-C833.